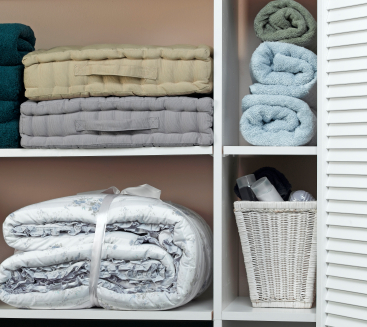 What’s In Your Linen Closet? Last week, I helped a client organize her linen closet. Like many linen closets, this one was crammed full of sheets, towels, toiletries and over-the-counter medications. There was so much stuff packed in there, it was hard to see what there was, let alone access a specific needed item. The first thing we did was pull out all of the sheets. After we discovered twin sheets that didn’t fit any bed in the house, we started a donation pile. (Many animal shelters are thrilled to take your old sheets and towels). To it, we added partial sheet sets (fitted sheet without the matching flat sheet and vice versa). We also decided to keep only two sets of sheets per bed; the rest went into the donation stack. The second step involved going through the towers of towels and got rid of the ones that were frayed and/or permanently stained. I was also able to convince her that since she rarely has overnight guests, four sets of “guest towels” were probably excessive; she agreed and pared down to two sets. Finally, we sorted and containerized products by category: a bin for oral hygiene; a bin for cough/cold products; another for hair care items, and one for first aid products. We also put a rolling cart with drawers on the floor below the closet shelves to hold seasonal items like sunscreen, as well as infrequently used items. We labeled each drawer so family members would know what was housed in each. Ninety minutes later …we gazed at a beautiful, streamlined linen closet where everything was visible, accessible and current. What a difference! 90 Minutes! What a difference!! I will be cleaning out my linen closet this week!!! 🙂 Thanks for the inspiration! Thanks for your comment, Joanne. Best of luck with your organizing project. Be sure to check back and let us know how it went.